We are engaged in offering a huge array of Daiken Mineral Fiber Ceiling to our customers. We offer these at market leading rates. Providing and fixing of ”Daiken” mineral fiber ceiling tiles [Made in JAPAN], with hot dipped galvanized steel grid work, surface chemically cleaned capping pre-finished in baked polyester paint, Main Tees 15 mm every 1.2M centre to centre, stitched cross Tee at 0.6 M centre to centre to form a grid of size 600 X 600 mm and suspending the grid from RCC roof using 3 mm GI rod, 6 mm nylon rawl plug and 6mm J bolt at every 1200 mm intervals. And laying “Daiken mineral fiber Acoustic ceiling tiles of size 600 x 600 x 15 OCR mm over the formed grid having fire rating of 60 minutes as per BS 47G/23 of 1987. Light Reflection of > 85%. Noise Reduction Coefficient (NRC) of 0.55 to 0.60, Density 294kg / Cu.mtr; Sound Attenuation of 36 db, K = 0.52-0.57 W/mk. Formaldehyde emission 0.00 mg / L. Humidity Resistance up to 99% at 50’C. 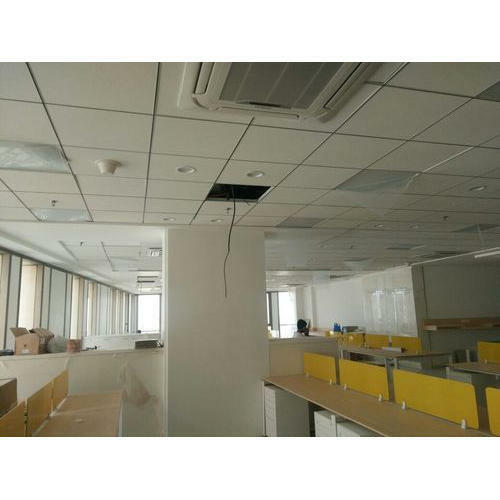 Shah Woodply is providing Cork Sheets, Toilet Partitions, Ceiling Panels, Fiber Ceilings. Our claim to success is hallmarked by the offered quality products that gained us huge recognizance. We are working towards development through a determined team of people to meet the most stringent requirements of customers and become leaders of tomorrow.